Unique French rock metal filled with thrashy guitars and loud vocals. Despite the lack of information on this band online, there is an abundance of rock and roll in Redmind. No Face is filled with 6 tracks that embody what this band is about. Their music is a mixture of rock neometal with speedy guitar licks, growling vocals and heavy drums to match. Redmind’s No Face might sound typical and the band might not break any boundaries with their music, but they do manage to pull through and create a solid sounding demo. 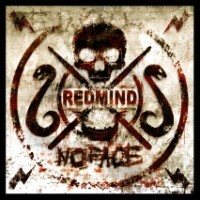 Redmind has released several demos as well as singles off their Myspace and Jamendo site. For No Face, the band combines and scouts out many different genres. For instance, it opens with “Diabolic country before the storm” which of course, preludes the metal mayhem that ensues after the somewhat acoustic country feel of the intro track. “Gimme” comes in next where the band makes a go at solos and slightly growly vocals. “TV Programs” is perhaps the most typical in terms of metal rock and roll. With the solid sounding speed metal riffs, heavy drumming as well as the shouty vocals, the song is instantly likable especially for hard rock aficionados out there. Although the group might not break any records when it comes to their music, No Face does provide enough interest for it to be worth a listen. This demo as well as their other releases are available under a creative commons license.